The Skinny: Not-bad sequel to the 1993 Ronny Yu masterpiece, The Bride with White Hair 2 is an admittedly underrated, but ultimately flawed piece of HK cinema. McMillin: When we last left swordsman Cho Yi-Hang (Leslie Cheung) in the original Bride with White Hair, he was meditating on the snowy slopes of Mount Shin Fung. 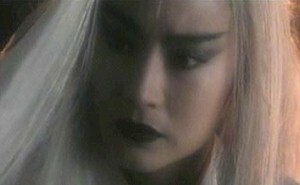 Due to Yi-Hang's mistrust of his lover, Lien Ni-Chang (Brigitte Lin), the poor woman's hair went from black to white and she slipped further into a bloodthirsty rage. Guilt-stricken by his betrayal, Yi-Hang stands ready on the frosty, precipitous mountain in the hopes of plucking a magical flower that may very well hold the key to healing his beloved Ni-Chang. In the meantime, Ni-Chang is content with slaughtering the remaining male members of the prominent clans. At the top of her list is Yi-Hang's nephew, Fung Chun-Kit (Sunny Chan), the last descendant of the once-powerful Wu Tang. Chun-Kit takes a wife named Lyre (Joey Man), but their wedded bliss is short-lived when Ni-Chang pays a visit to the clan. The witch kidnaps Lyre, indoctrinating the newlywed into her cadre of lethal, quasi-lesbian women warriors. Naturally, our substitute hero leads a ragtag group band of do-gooders, including the beautiful Christy Chung as the tomboyish Moon, in an assault on the white witch's inner stronghold. Notes: Though David Wu is credited as director, Ronny Yu is rumored to have orchestrated much of the sequel.